Gadacz, René R.. "Repatriation of Artifacts". The Canadian Encyclopedia, 10 April 2019, Historica Canada. https://www.thecanadianencyclopedia.ca/en/article/repatriation-of-artifacts. Accessed 26 April 2019. Most Indigenous ethnology collections found in Canadian museums today were gathered (and sometimes confiscated) by missionaries, government agents, amateur and professional collectors and anthropologists such as Edward Sapir and Marius Barbeau during the late 1800s and early 1900s. Today, many Indigenous nations are requesting that these items be returned to their true home. These replica house posts stand inside the reproduction of an old church that was here during the Spanish occupation. Yuquot, also known as Friendly Cove, was the centre of civilization when Europeans first made contact in the late 1700s. 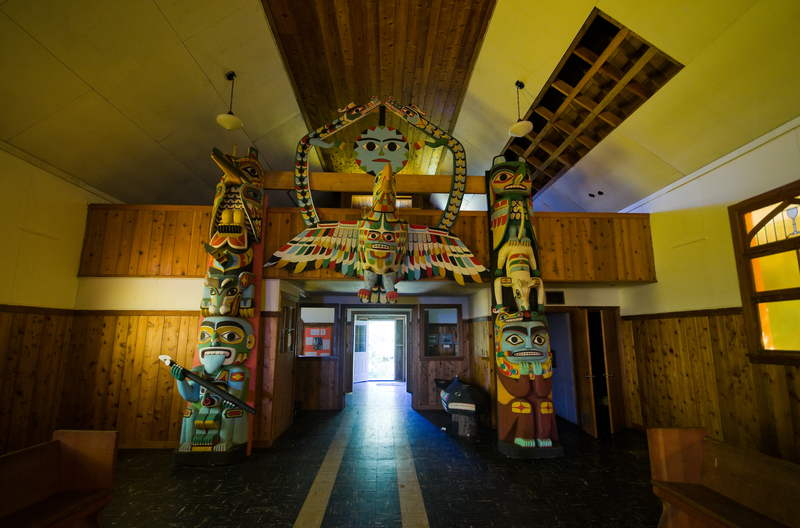 The Mowachaht / Muchalaht people remaining today are slowly reclaiming their culture and the many artifacts that were expropriated over the years. First Nations celebrate their people's achievements here during Yuquot Summerfest every August. Most Indigenous ethnology collections found in Canadian museums today were gathered (and sometimes confiscated) by missionaries, government agents, amateur and professional collectors and anthropologists such as Edward Sapir and Marius Barbeau during the late 1800s and early 1900s. At that time, Indigenous culture was believed to be dying out. These collections, which include thousands of everyday artifacts, ceremonial and sacred objects, ancestral skeletal remains and funerary objects, were intended to allow future generations of anthropologists and students to study traditional Indigenous cultures. Indigenous people have argued that they are alienated from the materials of their culture and heritage that are housed in the Canadian Museum of History and various provincial museums such as the Royal Ontario Museum, Glenbow Museum and the University of British Columbia Museum of Anthropology. Many groups are requesting that these items be returned to their people. Though no Canadian legislation exists to implement repatriation, museums currently consider requests on a case-by-case basis. Legality of ownership and communal ceremonial significance, as well as the physical condition or state of preservation of the objects, are taken into consideration. Sometimes repatriation is not practical, as when communities lack facilities or trained personnel in the management, care or use of materials. Museums may act as caretakers of collections on behalf of their traditional owners. However, many see the repatriation of cultural property as a necessary step toward reconciliation and decolonization. Many items have been returned to Indigenous nations. In 1978, the Canadian Museum of Civilization (now the Canadian Museum of History) returned confiscated potlatch items to the Alert Bay and Cape Mudge peoples. The museum also returned the Starlight medicine bundle to the Tsuut’ina (Sarcee) people of Alberta in 1989, and the Six Nations Confederacy’s wampum belts (the Circlet of the League, the Mohawk Chief's wampum and a Seneca wampum called The Three Sisters) in 1991. A decade later, the museum adopted a written policy on repatriation (see Museum Policy). Several other museums across the country also have, or are developing repatriation guidelines or policies. The topic of artifact repatriation is now commonly addressed in Canadian land claims. These agreements usually outline government responsibilities for helping First Nations to repatriate artifacts to their areas. The Nisga’a agreement (1999) was the first to include major provisions for repatriation. The Nisga’a have negotiated the repatriation of 200 artifacts from the Canadian Museum of Civilization and the Royal British Columbia Museum. The Labrador Inuit Land Claims Agreement (2005) also provides for the repatriation of nearly 80 artifacts from the Canadian Museum of Civilization. Several First Nations are establishing their own facilities for the safekeeping and exhibition of repatriated objects. In March 2017, the Canadian government agreed to return many of Louis Riel’s personal items to the Métis National Council, including his crucifix, poetry and clothing. Douglas Cole, Captured Heritage: The Scramble for Northwest Coast Artifacts (1985). Assembly of First Nations and Canadian Museums Association, Turning the Page: Forging New Partnerships Between Museums and First Peoples (1994). Canadian Museum of Civilization, Curatorship: Indigenous Perspectives in Post-Colonial Societies (1996). Ira Jacknis, The Storage Box of Tradition: Kwakiutl Art (2002).